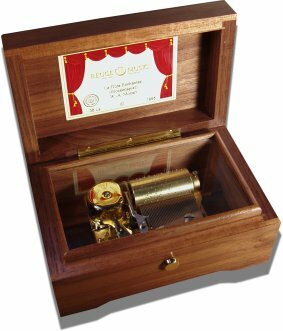 A superb range of music boxes from the Swiss maker Reuge and Jobin are available from the music box shop. 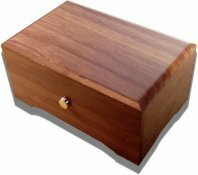 We offer both traditional plain walnut cased music boxes and musical jewellery boxes with marquetry inlay. Various sizes of musical movement are also available to suite your requirement including a choice of tunes. This larger movement music box gives a very impressive rendition of the popular classics. Most music boxes will be wound by a key from underneath. Some larger musical movements operate from the slide button on the front, so you are able to play the music with the lid up or down. To discuss your requirement why not give our friendly sales team a call on 01275834474 and we will do our best to help you choice the right musical box to suit your gift requirement. Please note - although we take as much care as possible to show pictures of the actual range of current products available, because this is a handmade product from wood, the designs & colours may naturally vary slightly from those shown.